The 2014 Toyota Highlander has some impressive numbers and we aren’t just talking about fuel economy. The 2014 Toyota Highlander will mark the company’s third generation of hybrids in its popular family crossover. Capable of comfortably transporting seven passengers in any weather, the Highlander is considered mid-size by some metrics, but it is now a very large vehicle. It has stretched three inches in length over the previous generation, which was not a small vehicle. For those not up to speed on Highlander Hybrids they come with a powerful V6 coupled to an electric drive and CVT transmission. There is very little sacrifice in power, unlike most hybrids. The 2014 Toyota Highlander Hybrid weighs in at just under 5,000 pounds. This is a very big, very heavy vehicle. However, the weight does not hurt the fuel economy. Toyota estimates the Highlander Hybrid will again hit a combined 28 MPG. If it does get that rating, and Toyota is conservative about these sorts of things (unlike Hyundai and Ford) It will be significantly better than the Nissan Pathfinder Hybrid which gets “only” 26 MPG. If 28 MPG does not sound that impressive, one must consider that this is an all-wheel drive vehicle of considerable size. The same Highlander with its V6 gasoline only engine only gets 20 MPG, which is about average for its category. That means this Highlander Hybrid gets fully 40% better fuel economy than the regular version. However, huge weight and a big fuel economy number are not the only large numbers that the Highlander Hybrid comes with. There is no “base” Highlander Hybrid anymore. Toyota never actually built many anyway. Now the Highlander only comes loaded. The entry price for this vehicle is $49,000 including destination and dealer documentation fees. If you want the best one, figure on $51,000 not including a couple of more costly packages. Toyota does point out that is a grand less than one would have paid for a 2013 Highlander Hybrid with similar features. That should make everyone happy except the suckers that just bought one of the last 2013s. For more money you can add a rear second-row entertainment package, a safety package with pre-collision, parking sonar, blind-spot monitoring, lane departure warning, and rear cross traffic monitoring. There was a time when Toyota bragged that every Highlander had the highest level of safety available. No more. Now you pay extra. A fully loaded Highlander Hybrid with all the added packages will creep into the $55,000 range. 2014 Toyota Highlander Hybrids can come with heated steering wheels, panoramic moon-roofs, and perforated leather captains’ chairs. Setting aside the badge, this vehicle would be very at home in any Lexus showroom. It is hard to see the economics of the Hybrid making sense. A very well appointed 2014 Highlander XLE gasoline only with the ability carry an extra passenger (8) with navigation will cost about $38,000. At that point one would never get the money back the Hybrid drive saves. However a more fair comparison is a fully loaded Highlander with no hybrid drive which will run about $44,000. That said, we realize it isn’t all about the Benjamins when it comes to Hybrids and other green car choices. For those who want a hybrid badge, seating for 7 in a big, safe, plush, all-wheel-drive vehicle, there is no better value than the 2014 Toyota Highlander. Note: Large story image is a 2014 Highlander Hybrid. Smaller gallery images below are of the standard 2014 Highlander. Most Informative as usual. On a personal note, I don't get Toyota, though. On one hand they tout themselves via marketing as the green company saving the planet, then they load up with a 5,000 pound heavyweight. The only advantage of the hybrid is that it saves a few MPG, but 28 combined is nothing to brag about, in my opinion. It points toward the need to reduce vehicle weight; and Toyota is NOT doing so great on that area it would seem. Your take? I think you are right. In defense of this particular vehicle, its weight is not unusual in non-hybrid form. About 750 pounds of this vehicle is the hybrid drive and batteries. Crazy! I prefer the heavier cars. I would rather save the lives of my family than save a few dollars on fuel. Ralph I believe you save a family by driving more attentively. 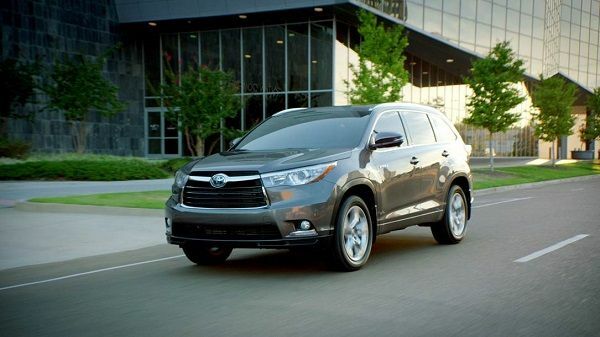 The 2014 Toyota Highlander Hybrid looks like a safe car. I stress Hybrid because you said about saving on fuel. I agree that good driving is the biggest factor in automotive safety, but dangerous situations occur in spite of the best driving. When two cars collide, physics takes over and safety is on the side of more weight. Yes, you are absolutely right. I would rather be in the heavy thing. I think you make an excellent point. If the 750 pounds was in front of the passengers I would agree 100%. Sadly, that weight is under the rear seats. Still somewhat helpful, but it is not going towards crashworthiness. In an impact with a tree or similar it is actually working against you. Thanks for pointing that out. Our writer alum, Don Bain, has written stories saying the same. You are both on target. My comment was not really about the hybrid Highlander specifically; it was about heavier cars vs. lighter cars, in general. All other things being equal, the bigger, the better when it comes to safety. As far as the distribution of a car's weight and how those loads are carried to the rest of the structure, I'm sure it makes a difference, but I have no data on which to make an educated comment.